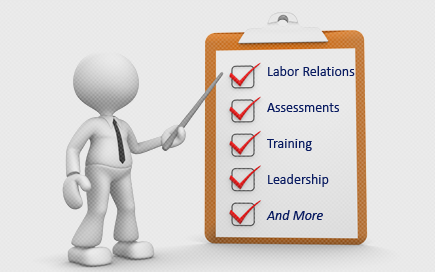 Labor Relations News Update April 14, 2014 | Oliver Bell, Inc. Unions or greens — which Keystone XL player is doing more to keep the Senate blue? For decades, the National Oil Bargaining Program has benefited oil workers by winning industry leading wages and benefits, job security protections, improvements in health and safety and process safety management at our workplaces. It’s never easy because even though oil companies enjoy labor stability, they attempt to take away our hard won benefits and undermine pattern agreements. Fortunately, labor unions represent the workers who process 77% of the oil in the U.S. and the USW represents a huge majority of the total number of the workforce. Union density—defined as the percentage of union representation within an industry or at a company—gives us a strong voice. Our collective strength depends upon our educating members on key policy issues at the local and national levels. By building power and mobilizing, we are able to maintain pattern bargaining and achieve acceptable contracts with some of the most powerful corporations in the world. It dramatically improves their standard of living. It sets an industry pattern that standardizes wages and benefits at U.S. oil refineries. It enables elected delegates from the membership to design key bargaining objectives for the negotiations. It calls for membership approval of the bargaining policy objectives. It institutes a safety culture within the oil industry and emphasizes employees’ right to a safe and healthful workplace. It establishes common expiration dates for union contracts that consolidate power for the bargaining process. It provides for “Successorship” language in USW contracts that preserves jobs, wages and benefits when facilities are bought and sold. It helps to create record profits in the oil industry by providing vital inputs from USW members. 2009—Preserved NOBP Pattern and Wage Increases in Face of Major Global Recession. 2012—Won lifesaving gains addressing key health and safety issues including fatigue and the creation of a new union-selected process safety management representative. President Obama is poised to disappoint a valuable swath of his base no matter how he rules on Keystone XL. But with Democrats facing a possible loss of Senate control next year, would alienating pro-pipeline unions or anti-pipeline environmentalists sting harder for the party? A definitive answer is unattainable, given that a final decision on the polarizing oil sands crude pipeline may yet slip past Election Day and that neither greens nor labor have offered overt threats to withhold cash from Democratic candidates. 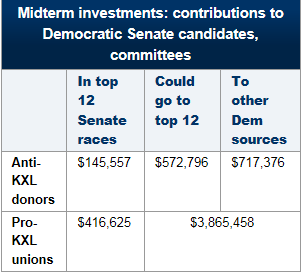 An E&E Daily comparison of top climate activists’ Democratic donations to those given by pro-KXL unions in a dozen hotly contested Senate races, however, offers an illuminating conclusion. The 150 leading Democratic donors who told Obama in May they would “support you in every way possible” on the climate fight symbolized by KXL have given $145,557 so far this election cycle to Democratic candidates in the top 12 Senate races — in Alaska, Arkansas, Colorado, Georgia, Iowa, Kentucky, Louisiana, Michigan, Montana, New Hampshire, North Carolina and West Virginia — according to E&E Daily’s analysis of Federal Election Commission (FEC) data (see graphic). The six top labor unions working to win KXL approval — the Laborers, the Teamsters, the Operating Engineers, the Carpenters & Joiners, the Pipefitters and the Boilermakers — have given more than 2 ½ times the environmentalists’ amount, or $416,625, to the races that stand to determine Senate control next year, E&E Daily found. Both camps’ totals include contributions to the Democratic Senatorial Campaign Committee and Senate Majority, a political action committee (PAC) formed to assist the party’s upper-chamber efforts. Betsy Taylor, the climate strategist who spearheaded last year’s donor letter and a flurry of other public pleas for Obama to reject KXL, noted that the prominent Democrats who signed onto her effort would not act as a bloc during the midterm election season. Amid an “epic struggle over our nation’s energy future,” Taylor said via email, allowing the heavy Canadian crude that KXL would carry turns Obama away from the International Energy Agency’s projection that averting a 2-degree-Celsius rise in global temperatures requires leaving two-thirds of global fossil fuel reserves undeveloped before 2050. The 150 climate-minded donors aligned with Taylor have given another $572,796 so far this cycle to political action committees that could use the money to help keep the Senate blue. However, $400,000 of that total went from vocal KXL foe Susie Tompkins Buell to the super PAC American Bridge for a project said to focus on the presidential prospects of Buell ally Hillary Clinton. House Democratic campaigns and PACs, as well as other sources not geared toward helping struggling Senate Democrats, received $717,376 from the wealthy environmentalists who signed last year’s letter to Obama on the pipeline. The pro-pipeline labor unions gave more than $3.8 million that is not directly headed to vulnerable Democratic Senate candidates or cannot be used on their races, E&E Daily‘s analysis found. Direct donations are hardly the only means to show gratitude or lack thereof to Obama’s party in the wake of his KXL decision, former FEC General Counsel Larry Noble noted in an interview. Labor groups could ramp up or shut off their traditional organizing and get-out-the-vote work, he explained, while wealthy donors often “bundle” other contributions that broaden their fundraising impact beyond individual checks. Any green donors or union leaders inclined to take out their frustration over KXL by locking up their checkbooks must wrestle with a purity test common in modern politics: Does keeping one’s party in line on a single issue matter more than keeping that party in power? Billionaire environmentalist Tom Steyer epitomized that dynamic earlier this year when he pledged $50 million of his personal fortune to support climate-friendly candidates in the midterms (Greenwire, Feb. 18). One of Steyer’s potential beneficiaries, Iowa Senate hopeful Rep. Bruce Braley, completed a conversion to public criticism of KXL, and Steyer’s top adviser later tamped down previous talk of ads against the pipeline in Louisiana, where pro-KXL Sen. Mary Landrieu (D) is fighting a fierce re-election battle. “[W]e’re certainly not subscribing to what I’d call the tea party theory of politics,” Steyer adviser Chris Lehane told reporters in February, adding that “we think it’s really important from a climate perspective” to keep Democrats in charge of the Senate. That approach aligns with that of another vocal foe of the pipeline, Sen. Sheldon Whitehouse (D-R.I.), who leads Congress’ climate change messaging task force and visited Nebraska last month to rally anti-KXL activists. Asked about his Oceans PAC’s decision to support the re-election of KXL backers such as Landrieu and Sen. Mark Pryor (D-Ark. ), both of whom also oppose U.S. EPA’s climate rules for power plants, he praised the Louisianan’s push to ensure that 80 percent of civil fines paid after the Gulf of Mexico oil disaster went toward coastal restoration. Craig Holman, government affairs lobbyist at the watchdog nonprofit Public Citizen, predicted that neither unions nor greens would significantly wound Democrats based on Obama’s pipeline decision. “I understand why both of these constituencies would want to put on that appearance,” he said, “but in the end, they’d be slitting their own throats if they did anything to imperil Democrats’ control of the Senate,” where Republicans need to flip six seats to regain the majority. In fact, the converse of the KXL threat might prove more realistic in the form of Democratic interests galvanized positively by a decision on the pipeline before November. Eleven Senate Democrats, most of whom will face voters this fall, yesterday urged Obama to end the pipeline’s long-running and politically whipsawed review process by next month (Greenwire, Apr. 10). A KXL rejection “will activate several important constituencies for Democratic candidates in 2014, including young voters, environmentally inclined political donors and important labor allies such as National Nurses United,” the influential environmentalist Taylor said. Steyer is also said to be mulling involvement in the Sunshine State re-election race of Republican Gov. Rick Scott, who has publicly questioned the science behind human-caused climate change. Another congressional climate hawk, Rep. Henry Waxman (D-Calif.), said he tends to advise Democrats to “ignore threats” from their supporters. But the KXL critic also urged donors to look past partisan labels and pre-midterm predictions to support candidates whose personal beliefs pass muster. Attending IndustriALL Global Union’s World Conference for the Energy Industries, some 250 union leaders from 45 countries adopted an ambitious and vibrant plan of action for the next four years reinforcing unity and fighting back against similar anti-worker tactics throughout the world. Hosted by IndustriALL’s two affiliates FITAG-UGT and Industria-CC.OO., the Conference made an extensive debate over the five strategic goals of the global union which were endorsed by the Executive Committee. Delegates reported similar stories from all five continents of trade unionists in the industry being undermined by precarious work, aggressive liberalization, unsafe work and union busting. “Unions in the industry are fighting back”, IndustriALL General Secretary Raina told delegates in his opening address. “Every day is a campaigning day for IndustriALL Global Union”. Spain’s Secretary of State for Energy Alberto Nadal addressed the conference in its opening session, giving importance to developed industrial relations with IndustriALL’s Spanish affiliates. The country’s highest energy official told delegates: “Energy should be a universal right for all. Without cheap energy, there is not development, and without secure energy, no economic growth. Energy is the base of all economies”. The conference sought to analyse and develop progressive energy policies that fully take into account the interests of workers faced with rapid change in national energy policies and structures, and ensure change is managed through a process of “Just Transition.” The energy industry plays a key role in IndustriALL’s worldwide initiative of “Sustainable Industrial Policy”, particularly with its close connection with manufacturing sectors as well as sustainability matters. In addition to the action plan, the Conference unanimously passed five emergency resolutions, issuing urgent solidarity and support for UWUA members under attack in the US by FirstEnergy; in Iraq where an inspirational trade union leader has received death threats against her family; in Indonesia where Pertamina management is acting with impunity and ignoring a court ruling to punish workers for organizing; in Australia where oil giant Chevron is union busting the MUA; and extending solidarity to the Mexican union of electricity workers. The delegates also applauded IndustriALL’s close cooperation in the energy sector with other sister global unions, PSI and ITF, to advance alliances in the supply chain. New co-chairs of the sector were elected by delegates in line with the new policy of IndustriALL whereby each industrial sector will be jointly chaired by one woman and one man. The new co-chairs of the energy sector are Apsorn Krissanasmit of Thailand and Leif Sande of Norway. The Conference also formed an Action Group to handle the day-to-day work of the sector. The make up of the group again reflects the regional, sub-sectorial and gender balance in the industry: Gwenne Farrell of Canada, Linda McCulloch of Workers’ Uniting, Jean-François Renucci of France, Lev Mironov of Russia, Kaoru Kishimoto of Japan, Pablo Emilio Santos Nieto of Colombia, Jorge Fierro Andrade of Chile, Abdelmajid Matoual of Morocco, Aly Al-Adwani of Kuwait, Ady Lombume of Democratic Republic of Congo, and Mfanawelisontfo Dlamini of Swaziland.